This programme will provide a foundation upon which you can build your core skills, personal development and employability skills and will include work experience. You will achieve a SQA Personal Development Award and complete a programme to increase confidence, soft skills and motivation. The course will also offer employer visits, health and wellbeing sessions and one to one support and guidance. Employability Skills – CV Building, Basic Interview Skills, Money Skills, Awareness of Local Opportunities, Health & Safety in the workplace, Placement Expectations. Out of hospital CPR doubles the likelihood of survival in people who experience out-of-hospital cardiac arrest. This course is a short, fun and interactive look at first aid leading to SQA Level 3 Qualification. Come along and learn how to save a life! online test and your CITB Green Card. This training is offered to unemployed individuals, living in Lanark and surrounding rural areas who are aspiring to work in the construction industry or to update their out-of-date card. It’ll give individuals the knowledge and understanding to undertake jobs safely on a construction site. This qualification covers common hazards and risks in a construction environment, safe manual handling practices, working safely at heights and working safely around plant and machinery. You’ll attend on a Thursday from 1.00 pm-3.00 pm for 4 weeks. On the 4th week you’ll sit the SQA Health and Safety in a Construction Environment Unit (HX12 04). Only when you’ve passed the SQA unit, on the 5th week you’ll attend South Lanarkshire College, East Kilbride for your online CITB Operatives CSCS test (transport will be organised from Lanark and return). On successfully passing this test, South Lanarkshire College will apply for the CSCS Labourer Card on your behalf. 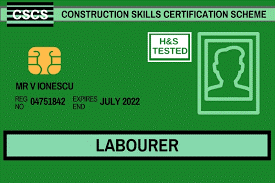 Once you have your CSCS card (usually within 2 weeks of passing your test) you can apply for labouring jobs on a construction site. CPC (driving modules), fork lift licence, resit lapsed gas qualification and any other qualifications* you may require. (*funding is limited so please contact one of the team to ask about your specific requirements). We welcome applications and enquiries from everyone who’s looking to get back into employment and needs a helping hand. Whatever your circumstances and whatever level of support you need, you’ll be advised on the best way for you to gain new skills, qualifications and experience, to maximise your chances for a job related to the energy/utility sector and its supply chain.